Located at a distance of 52 kilometers from Jalpaiguri, 15 kilometers from Lataguri and 10 kilometers from Chalsa, Gorumara National Park can be found on the floodplains of Rivers Murti and Jaldhaka in the Terai Region of the Himalayan foothills. The main highlight of Gorumara National Park is the overwhelming population of Indian rhinos. It is one of the best protected and well maintained parks according to the Ministry of Environment and Forests. The park covers an area of 80 square kilometers and the best time to visit the park is during the month of November through February when the weather is pleasant. Gorumara is located at a convenient position which can be reached by air, through rails and roads. Gorumara can be reached from Bagdogra within 2 hours through a winding road flanked by tea gardens. Alternatively one can reach the park by hiring a jeep or car from New Malbazar railway station or Maynaguri railway station. The car will take the National Highway 31 to Lataguri, the entrance to the park. For adventurous tourists you can take the path less trodden through Gajaldoba barrage over Teesta to reach Lataguri on the park outskirts. There are plenty of accommodation options around Gorumara National Park suiting the pocket of the travelers. There are budget accommodation facilities for tourists traveling on a stringent budget and on the other hand 3-4 star hotels and resorts display grand hospitality to the ones traveling extravagantly. The largest concentration of big budget resorts can be found in Lataguri. Both government and private resorts are available. Aranya Jungle Resort and Banai, WBFDC forest lodge near Murti River are the most popular ones. Some of the others include Aranya Resort – Lataguri, Riverwood forest retreat – Dhupjhora, Kakur Bari Resort – Dhupjhora, Sinclairs Retreast, Murti Cottages, Kalipur Eco Village and Dhupjhora Elephant Camps. The diversity in the national park in terms of flora and fauna is astounding. It is home to 193 species of birds, 50 species of mammals, 22 species of reptiles, 27 species of fish and 7 kinds of turtles. All these different kinds of animals inhabit the park full of sal, teak, Bombax, grassland vegetation and Shirish trees. Different types of tropical orchids can also be found at the park. 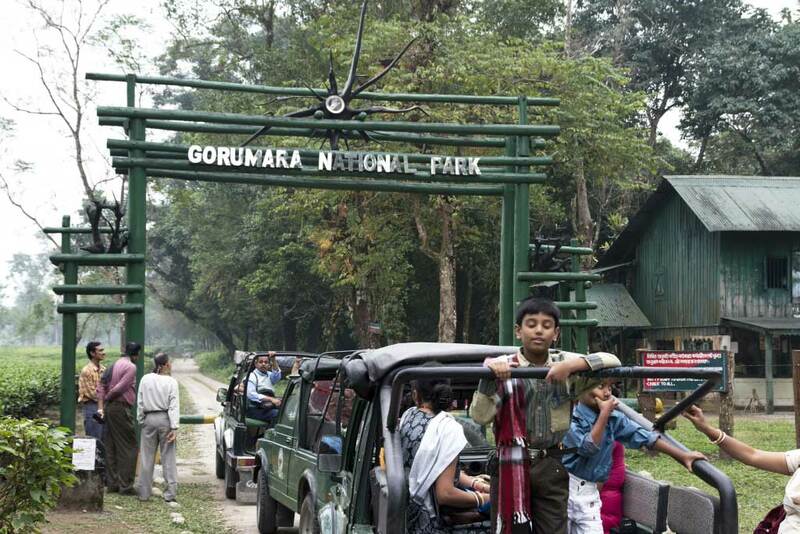 Gorumara is also famous for the safaris conducted for tourists. The entry fee at Gorumara is 40 INR. To see the fauna from close quarters you can opt for safaris which you have to book from the forest department. Jataprasad is a famous watchtower named after the legendary female elephant Jataprasad located on the northern side of the park. There is also the Rhino Point close by. 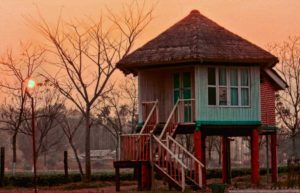 Methla Watchtower is in Kalipur eco village where a unique bullock cart driven safari is available. The others include Chukchuki Watchtower, Chandrachur Watchtower and Chapramari Watchtower. Rhinos, elephants, bisons, leopards and many other animals can be spotted from the watchtowers. Some of the other tourist attractions nearby include Jhalong, Bindu, Caron, Diana, Bhutan, Paren, Kalimpong Hills, and Jaldhaka. This entry was posted by indispottravel in Dooars in West Bengal, Forest Bungalow in West Bengal, Jungle Safari in West Bengal, National parks and wildlife sanctuaries in West Bengal, Weekend Destination around Kolkata, West Bengal, Wildlife in West Bengal and tagged accommodation availability at gorumara forest bungalow, accommodation in Gorumara National Park, accommodation options around Gorumara National Park, alternative routs to reach Gorumara National Park, Aranya Jungle Resort, Aranya Resort, attractions of Gorumara National Park, Banai, best time to visit gorumara national park, best time to visit the Gorumara National Park, best tourist lodge at Gorumara National Park, bisons, budget accommodation facilities around Gorumara National Park, bullock cart safari at Gorumara National Park, Chandrachur Watchtower, Chapramari Watchtower, Chukchuki Watchtower, Dhupjhora Elephant Camps, distance of Gorumara National Park from Bagdogra, distance of Gorumara National Park from Chalsa, distance of Gorumara National Park from Jalpaiguri, distance of Gorumara National Park from NJP, distance of Gorumara National Park from Siliguri, dooars, dooars in west bengal, elephants, entry fee of Gorumara National Park, famous tourist lodge at Gorumara National Park, Forest, forest lodge, good tourist lodge at Gorumara National Park, Gorumara, gorumara forest, gorumara forest bungalow, gorumara forest rest house, gorumara hotels, Gorumara location, gorumara national forest, Gorumara National Park, gorumara national park accommodation, Gorumara National Park area, Gorumara National Park attractions, gorumara national park camera, Gorumara National Park highlight, gorumara national park hotels, Gorumara National Park location, Gorumara National Park on the floodplains of Rivers Murti and Jaldhaka, gorumara national park photos, gorumara national park safari timings, gorumara national park travel guide, gorumara tourist lodge, gorumara wildlife sanctuary, government and private accommodation options in Lataguri, government and private accommodation options near Gorumara National Park, highlight of Gorumara National Park, hotels around Gorumara National Park, how to reach Gorumara National Park, ideal time to visit the Gorumara National Park, Indian National Park, jeep or car from Maynaguri railway station to Gorumara National Park, jeep or car from New Malbazar railway station to Gorumara National Park, Jhalong tourist lodge, jungle safari in Gorumara National Park, Kakur Bari Resort, Kalipur Eco Village, Lataguri is the entrance of Gorumara National Park, leopards, Methla Watchtower, Murti Cottages, National Park, National Park of india, popular tourist lodge at Gorumara National Park, reaching Gorumara National Park, reaching options to Gorumara National Park from NJP, reaching time to Gorumara National Park from Bagdogra, resorts around Gorumara National Park, Rhino Point in Gorumara National Park, Rhinos, Riverwood forest retreat, Sinclairs Retreast, trek toute to reach Gorumara National Park, variations of Gorumara National Park, watchtower in at Gorumara National Park, WBFDC forest lodge, WBFDC forest lodge near Gorumara National Park, WBFDC forest lodge near Murti River, what is the entry fee of Gorumara National Park, what is the ideal time to visit the Gorumara National Park, what is the time to visit the Gorumara National Park.